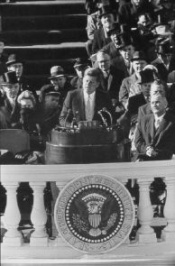 Omega Blogger – All About Omega Watches » John F. Kennedy – Inauguration Omega for Sale Soon? John F. Kennedy – Inauguration Omega for Sale Soon? WASHINGTON, June 15 /PRNewswire/ — Thousands of documents, artifacts and other items related to President John F. Kennedy and Jacqueline Bouvier Kennedy may be sold to the public under terms of a settlement agreement reached today between the National Archives (NARA), Caroline Kennedy and Jacquelyn E. White, the widow of Kennedy memorabilia collector Robert L. White. An Omega watch worn by JFK at his inauguration, January 20, 1961. This entry was posted on Sunday, June 19th, 2005 at 4:31 pm	and is filed under Uncategorized.